Windy & Carl, "Dedications to Flea"
12/12 Windy + Carl's return comes as a very welcome surprise. I assumed Consiousness would be their swan song, which was quickly reinforced by an exhaustive, 3-CD set of singles, rarities and previously unreleased tracks. By the time a band gets around to issuing a set like this, you usually don't end up finding them back on their feet, pushing for new ground. 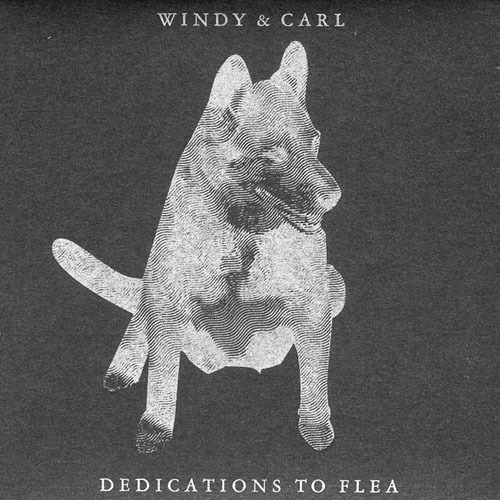 During their 4-year hiatus, their beloved dog Flea (half of the namesake of their imprint, Blue Flea) died, and Windy + Carl have released this small edition of mini-albums as a tribute. As the first in the new Brainwashed Handmade series, it bodes well for the aesthetic of future releases, not to mention placing the bar very high for the musical content of the series. Windy + Carl's gauzy palette is as intoxicating and gorgeous as ever. On "Ode to a Dog," there's a crystalline quality to some of the guitar work that adds a previously unmatched vibrance to their well developed vibe. Carl somehow balances two opposing qualities: distinct, rolling tone patterns, and dense, burrowing drone fuzz. The guitars are 3-D, rendered in immaculate detail. In keeping with the theme of the release, a recording of Flea is included on "Sketch for Flea," as an added texture to the gentle sonic tide. The inclusion of this recording is done very well, as it oftentimes blends in well enough to sound like something altogether different. At several points, Flea's panting could be easily be mistaken for scraping wood. This kind of "gimmick" in a song generally turns me off very quickly. This is done with such a delicate touch and sincerity that it works wonderfully. This mini-album will certainly prove to be among my favorites of their catalog (Antarctica, Depths, and Drawing of Sound). In the current drone scene, terrestrial vibes rule. Be it Wooden Wand & the Vanishing Voice, Kemialliset Ystavat, Skaters or Anthony Milton (for random example), they all share a photocopy-of-a-photocopy aesthetic, grainy, rough and colored in extreme contrast. Windy + Carl's return amid this fervor casts their music in even starker contrast than when they were placed amid bands like Fuxa, Transient Waves, Bowery Electric, etc. That they've outlasted all of those, and have maintained such a forward-thinking view of their music is nothing short of astounding. Dedications to Flea -- an EP recorded to commemorate the passing of the couple's dog, not the Chili Peppers member (and you thought you were finally going to learn what slap bass sounds like in the existential void!) -- sports the collection's best track, "Ode to a Dog". Windy and Carl can't seem to decide whether they want to return to their jangly pop roots or to go off the deep end into an eternal drone; they show signs of drifting toward one extreme, but always quickly recoil into placid middle ground. Ben Lee wasn't just playing '90s slacker dude when he sang "A lot goes on, but nothing happens" -- he was predicting this piece of sublime ambiguity. "Sketch for Flea" is less successful; it's a collection of recordings of Flea, embellished with light strains of melody, but it's more remarkable for its sentiment than its sonics. Michigan space-rock lovers will undoubtedly rejoice at Windy and Carl's return to the fold, and after a five year wait, even "The Eternal Struggle" is a welcome opportunity to renew the relationship. Hopefully the ambling dreamscaping will end as the couple gets back in the habit of recording, and they'll treat us to more subtle tensions in the future. - Phillip Buchan, Splendid.